When I decided I wanted to create a Karri dress sample with piping in the seams, I did the normal thing, and headed straight to the closest large sewing supply store. And guess what? As i should have expected, the only piping they had in stock was white, and stiff, and no-one could tell me what the fabric content was though of course it was probably polyester. SO. Whats a girl to do when she has a ridiculous specific idea of what she wants? Make it herself! I don’t know how i ended up talking about myself in the third person… so i’m just going to stop now. Anyway, I found that making my own piping was super easy and also surprisingly, super satisfying. 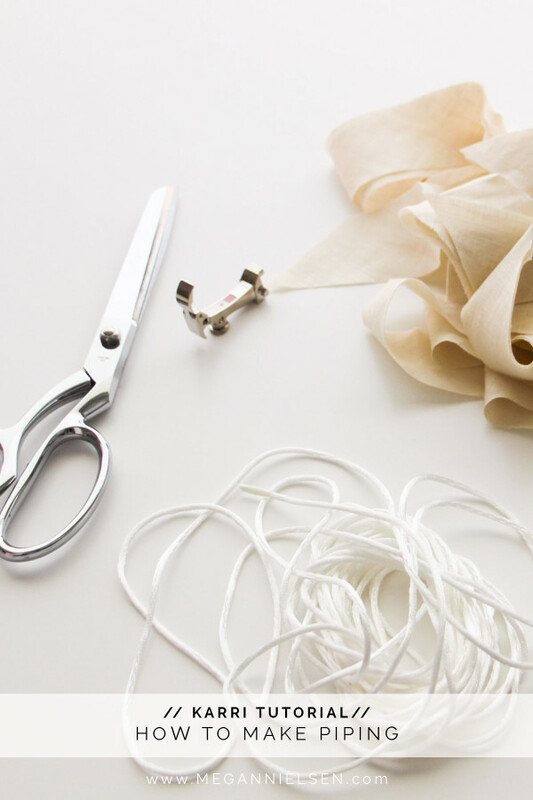 If you have already discovered the joy that is making your own custom bias tape, then you are going to love making your own custom piping. The amazing thing about making your own piping is that you get to choose what fabric you use, and make it match your project perfectly. Cue sewing excitement tears. Lets get started – you’re going to love how easy this is! Cording. Most cording is 1/8″ (3mm) wide. I’m going to assume this size in my calculations below, but please double check whatever cording you buy and adjust measurements accordingly. Bias tape. Think carefully about how wide you want your bias tape to be. Most store bought piping is 1/2″ (1.3mm) wide. I find this to be an irritating width. It means that the piping is just narrower than a standard seam width, which makes it a pain to insert into a seam. I prefer to make my piping so that it lines up perfectly with the raw edge of my garment seam, it makes it easier to sew and if it’s too bulky you can always trim away the excess afterwards. 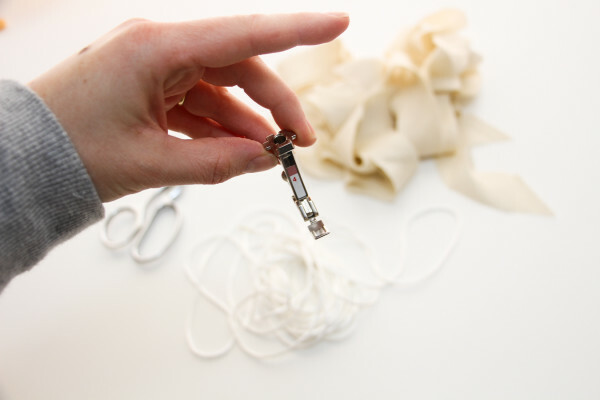 Most cording is 1/8″ (3mm), but check the cording you have available to you in store. So if we want our piping seam to be 5/8″ (1.5cm) and our cording is 1/8″ (3mm) then our finished width of piping will be 3/4″ (1.9cm). This means cutting our bias strips to be double that width = 1.5″ (3.8cm). 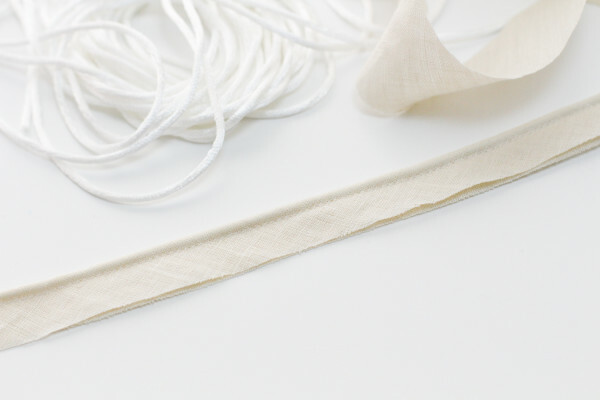 Once you have your width figured out follow this tutorial to make your own bias tape. Narrow zipper foot or Piping foot. 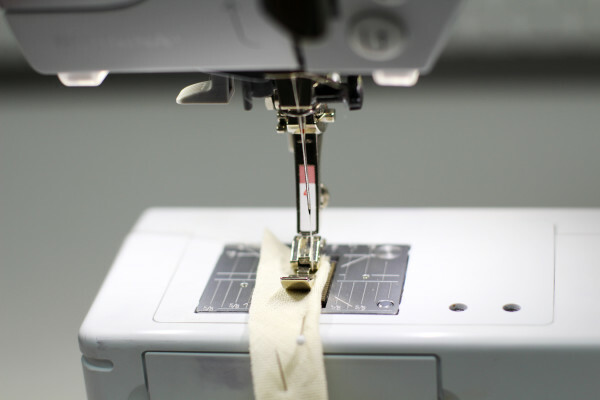 For a Bernina the narrow zipper foot is #4. Obviously if you have a piping foot, then you can use that, but I don’t have one, and i think it’s only really for attached piping? Correct me if i’m wrong. I recommend the narrow zipper foot as it’s easy, and I think most people have it in their kit. Make sure that you prewash your cording before you begin. This is something i always forget to do with trims, but as one kind commenter noted, her cording though polyester shrunk considerably after it’s first wash. I think its worth avoiding that after your garment is constructed! 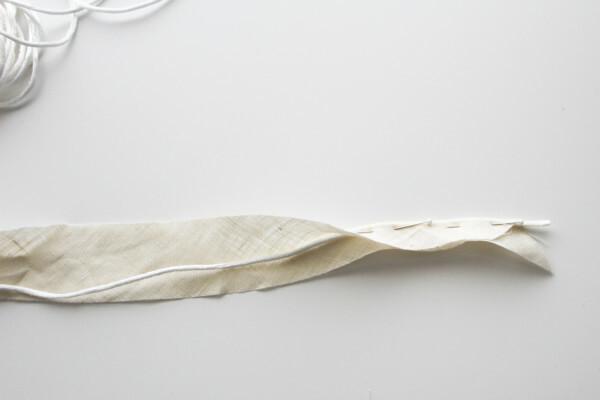 First up make some bias tape using this tutorial. In this example my bias tape is 1.5″ (3.8cm) wide and 10m long (i know that sounds like a lot, but it’s because i put it in almost every seam of my dress). My fabric is an flax colour linen. I used linen because i had it in my stash, it was the right colour, and because i love how easily linen manipulates to curves when pressed. Given these strips use the bias, you can basically use any fabric you want, as long as it isn’t too thick or stiff to work with. 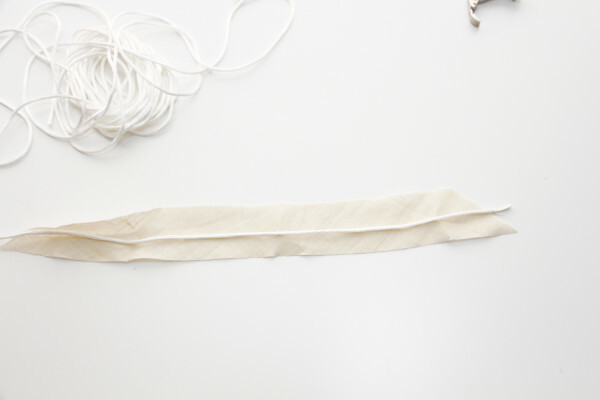 After cutting your bias tape, you will now lay you cording carefully down the centre of the strip. Fold the fabric over to enclose the cording, and pin carefully. Make sure that your fabric raw edges are lined up, and be very very careful that you do not stretch your bias strip as you do this, you don’t want to warp it at this point. 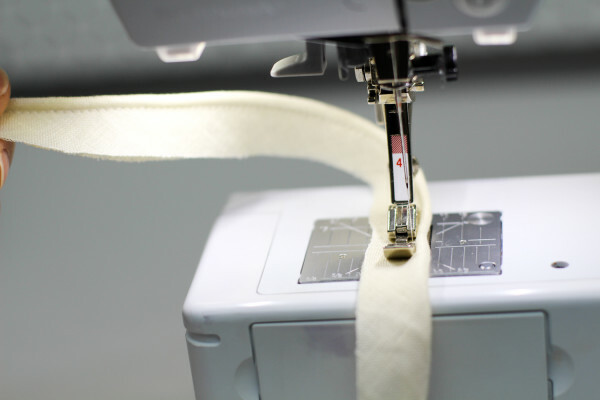 Over at your sewing machine, stitch next to the cording with a long stitch length to enclose it. Do not stitch on the cording, and don’t be too “tight” at this point. Keep in mind that you will need to move your machines needle to the right (or left depending on how you want to sew your cording). And that’s it! You’re done! You made piping! Tell me that wasn’t ridiculously easy? Stay tuned because later this week i’m going to show you how to insert this piping into the seams of your Karri dress! Any questions please let me know in the comments! 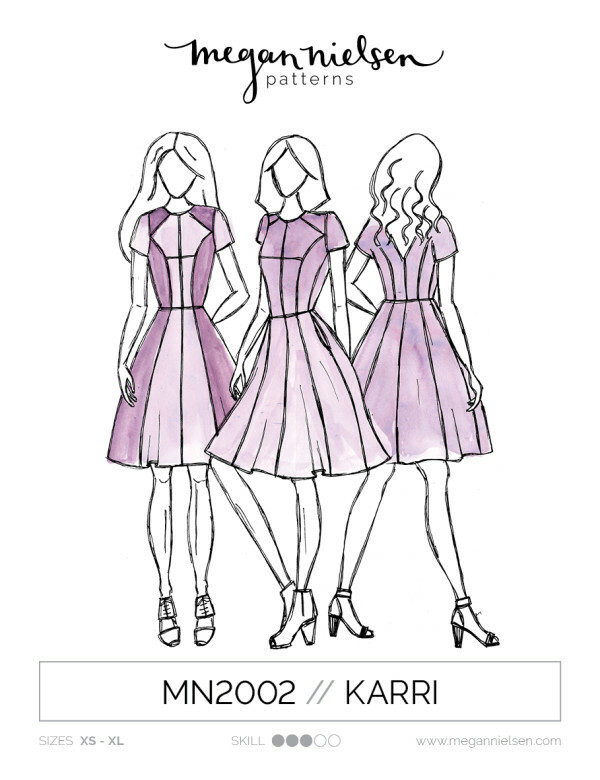 Karri dress pattern tester roundup! Don’t have the Karri sewing pattern yet? Get it in store here! We absolutely love seeing what you make, so don’t forget to tag your creations with #MNkarri and @megannielsenpatterns if sharing on social media. Thank you Megan. That tutorial was very clear. I just have a question about the actual cord, is it cotton like butchers cord or polyester? I am wondering how the piping responds to laundering. I have never bought the cording before. I try to make garments that are laundered at home to keep down the dry cleaning costs. Hey Karen! 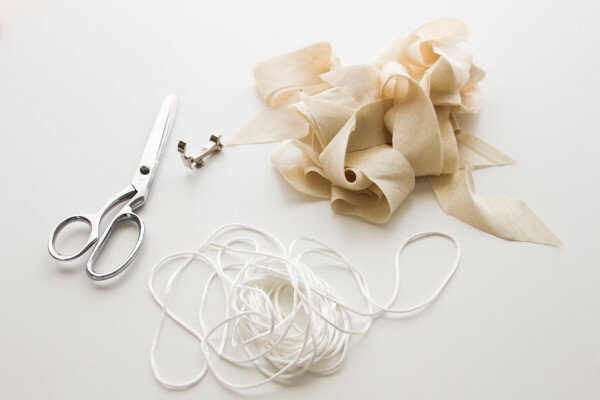 The only cording i found was polyester – but i’m sure cotton cording would work just as well. You would definitely need to prewash cotton cording as i can imagine that was shrink significantly. Though as another commented noted, her cording was polyester and shrunk a lot anyway! I think i would have preferred cotton if i could have found it :) I’m like you, I much prefer to careful clean my own garments and avoid the dry cleaners – it’s not just the costs, their chemicals are so harsh! Many years ago I bought a ruler with a groove in it for piping which included several yards of piping cord. The instructions recommended always washing cording before using it. I was very surprised by how much it shrunk as it appeared to be polyester. I would suggest ALWAYS washing piping cording before use. I’ve found trims can shrink a lot, especially rickrack braid. I remember trimming a little dress for my daughter Megan (great name, eh?) with it and when I washed it, the rickrak shrunk enough to spoil the look and meant I had to unpick it all, buy more, wash the new lot and apply again! Why do we so often have to learn the hard way?? Does it have to be cut on the bias? I’m hoping to make velvet piping for a cushion but I don’t have much material to work with as velvet is so expensive, do you think it could still work?